Recently, I had to go to the DMV, which is almost as bad as going to the dentist. I was dreading it, with every fiber of my being. Yet, after being in TN for a couple months now, it was about time I get another photo taken in which I resemble a child molester. I was well overdue. – I was greeted by a woman with yellow, blue, and green hair. Her nails were long enough to be classified as deadly objects, in much the same way as Freddy Krueger’s claw glove would be. Her fake eyelashes were not glued correctly, were too large, and made her look like something out of Pan’s Labyrinth. – The only 2 employees present made it abundantly clear that they hated each other. They passive aggressively traded snide comments while making the already impatient patrons wait even longer. – There was a small unsupervised child running around. The parents, who spoke no English and only knew how to smile and nod, were a complete waste of parental authority. Shortly after the child demon snuck behind the counter, ate one of the employees lunches, and turned off the ID printing machine (which made us all wait another 25 mins for it to warm back up) I decided to herd the blood sucker back to its parents. I proceeded to loudly and with a huge grin on my face tell them “YOU ARE BAD PARENTS! YOU SHOULD NOT BE ALLOWED TO PROCREATE! PLEASE RESTRAIN YOUR TINY BEAST!”. They responded only by smiling and nodding…. not having a damn clue what I just said. 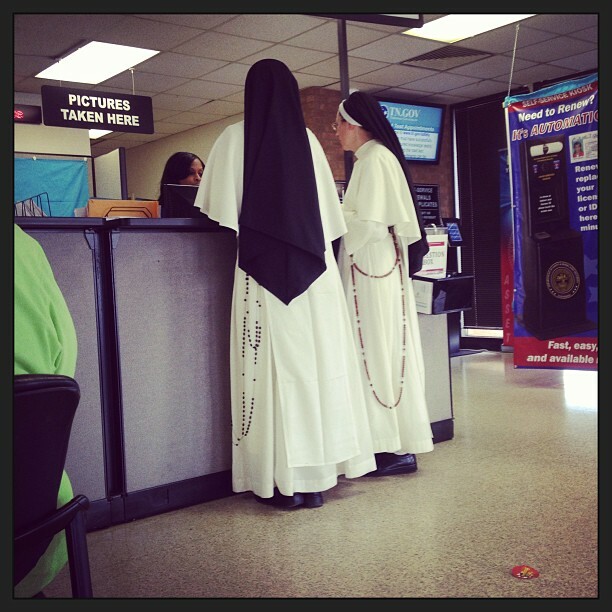 – 2 nuns walked into the DMV (no this is not the start to a bad joke). They were in full garb and only spoke Italian. The woman behind the desk only spoke in Ebonics. Needless to say the conversation was hysterically pointless. – The 2 employees I referenced earlier decided that getting into a full out brawl was appropriate. It concluded with one woman grabbing the other woman’s weave right off her head because it’s not a true “hood fight” until someone’s weave gets yanked. Somehow I managed to survive this trip without stabbing someone or going to jail.